2000: Richard James acquires the biggest shop space on Savile Row at No 29. The ‘goldfish bowl’ glass windows slice Savile Row and Clifford Street at right angles like a breathtaking infinity pool of bespoke, made-to-measure and ready-to-wear Richard James. 2001: Former Huntsman head cutter Richard Anderson opens his bespoke tailoring house at No 13 Savile Row. His partner and co-founder is Brian Lishak, a Huntsman man with half a century of experience on the Row. Having apprenticed while still at St Martin’s fashion college with Edward Sexton, Stella McCartney invites Sexton to develop the tailoring for her debut as creative director of Chloe. On the embroidery front, S. Lock and M. Hand come together to form Hand & Lock. 2002: In an intriguing collaboration, former Anderson & Sheppard apprentice and enfant terrible of British fashion Alexander McQueen unveils a bespoke collection made by H. Huntsman & Sons. The exquisite but prohibitively costly enterprise is quietly terminated. Nick Hart opens Spencer Hart at 36 Savile Row, combining a bespoke sensibility with the severe chic of old school Prada, Jil Sander and Helmut Lang. He goes on to dress David Bowie, Jay-Z, Jamie Foxx and Kanye West. 2003: After a management buyout, Kilgour drops the French & Stanbury and appoints Carlo Brandelli as creative director. The house sets about ‘sexing-up’ Savile Row in a strategy not dissimilar to Tom Ford’s at Gucci in 1995. Sir Hardy Amies, a Savile Row legend and one of its greatest patrons, dies. He is succeeded by his protégée Ian Garlant, who remains creative director of the house. 2004: The Savile Row Bespoke Association, the organisation designed to represent bespoke tailors’ interests on the Row, is formed. Founder members include the Royal Family of bespoke tailoring: Anderson & Sheppard, Dege & Skinner, Gieves & Hawkes and Henry Poole. Having flirted with liquidation, H. Huntsman & Sons is saved by four sympathetic investors including present MD David Coleridge. The Savile Row Bespoke Association acts to protect the craft and good name of Savile Row and ward off interlopers by registering the Savile Row Bespoke Association label. The label is to appear in each of the Savile Row Bespoke Association members’ bespoke garments and serves as a guarantee to the customer that he or she is in receipt of a genuine, bespoke, made on Savile Row piece of clothing. 2005: Anderson & Sheppard is forced to vacate No 30 Savile Row and relocate to 32 Old Burlington Street. Gieves & Hawkes make morning coats for The Princes William and Harry to wear at the wedding of their father Prince Charles to Camilla Parker-Bowles (now Duchess of Cornwall). 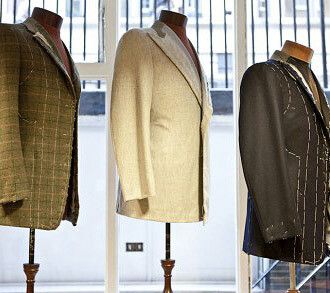 Timothy Everest edges closer to Savile Row with a bespoke and made-to-measure studio on Bruton Place in Mayfair. Young entrepreneur Patrick Grant and his investors acquire Norton & Sons from the Granger family. Tom Ford exits Gucci Group as creative director and commissions Anderson & Sheppard to make white tie and tails for a defiant photo shoot in W magazine to publicise the launch of his own bespoke tailoring house. 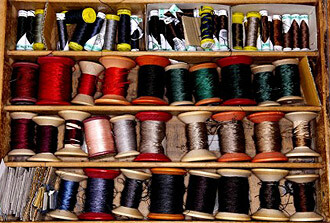 Embroiderers Hand & Lock move to Margaret Street. 2006: Gieves, the fashion-led boutique brand within Gieves & Hawkes designed by Joe Casely-Hayford, is shown on the catwalk during Paris Fashion Week for the first time. Henry Poole’s Savile Row lease is signed for a further 15 years and both shop and workshops are gutted and refurbished to bring Poole’s into the 21st Century. Ozwald Boateng’s US reality TV show The House of Boateng is aired on Robert Redford’s Sundance Channel and brings his vision of New Generation Savile Row dandyism to the cable generation. Chittleborough & Morgan open a new space in the basement of No 12 Savile Row. Richard Anderson rocks the Row with a black sequin dinner jacket that is ordered by Bryan Ferry and photographed worldwide. Douglas Hayward’s daughter Polly succeeds her father as MD of the company. 2007: Florentine fashion foundation Pitti Immagine Uomo commission the first major exhibition dedicated to Savile Row bespoke tailoring. Titled The London Cut, The exhibition runs for a month at Palazzo Pitti and is accompanied by a book written by the curator James Sherwood. The Chambre Syndicale de la Haute Couture invites Savile Row to bring The London Cut to the British Ambassador’s residence in Paris during July Couture Week. Richard James opens a new shop on Clifford Street dedicated entirely to his bespoke service while Ozwald Boateng takes Anderson & Sheppard’s old site at No 30 Savile Row for his first flagship store and cutting room. After a brief, unhappy marriage between Japanese jeans brand Evisu and Anthony J Hewitt, Hewitt MD Ravi Tailor leaves the Row to work from L.G. Wilkinson on St George’s Street. Robert Gieve, the fifth and last generation of the family to serve Gieves & Hawkes, dies. 2008: The legendary celebrity tailor Douglas (The Italian Job) Hayward dies. A new Archive Room at Gieves & Hawkes at No 1 Savile Row is curated by James Sherwood and inaugurated in honour of the late Robert Gieve. In March 2008 The London Cut exhibition is invited to show at the British Ambassador’s Residence in Tokyo. A satellite exhibition then travels to Isetan in Tokyo where Savile Row dominates the prestigious store’s windows and exhibition space. A three one-hour episide documentary mapping a year in the life of Savile Row is aired on BBC4 while BBC2 follows The London Cut to Tokyo for a further British fashion series to be aired in the autumn. One of the Row’s best dressed men, former Huntsman Head Cutter Brian Hammick, sadly dies. 2009: Queues form when Savile Row puts on its revealing ‘Below the Row’ show for one of the Victoria & Albert museum’s Friday Late exhibitions. Curated in conjunction with the V&A by students Chris Pollard and Susan Paisley, the exhibition shines light on the ‘dark art’ of bespoke tailoring by creating a working tailor’s shop and rarely seen subterranean workshop. The public’s increasing interest in the inner goings on of the Row is served with the publication of Richard Anderson’s fascinating book Bespoke: Savile Row Ripped & Smooth. 2010: Savile Row gathers en masse at the vibrantly refurbished Savoy hotel in London to celebrate the publication of James Sherwood’s definitive study of the Row’s inhabitants and their craft, Savile Row: The Master Tailors of British Bespoke. To help the occasion along, the Savoy invents the Savile Row Collins, a fine, stealthy gin based cocktail. Onlookers are agog as sheep appear on a grassed over Row for the hugely successful Savile Row Field Day, which is held in support of the Campaign for Wool, whose aim it is to increase demand and awareness of the wool industry. 2011: Another insider’s account of life on the Row as Michael Skinner’s (he of Dege & Skinner) enthralling book The Savile Row Cutter is published. The 150th anniversary of the tuxedo is celebrated by its inventor Henry Poole & Co and students of the London College of Fashion, who, in conjunction with fabric supplier Dormeuil, set about re-inventing the iconic jacket. The 21st century tuxedos go on display in Harrods and Burlington Arcade in London before appearing at the tuxedo historical society in New York. Does any other jacket have its own historical society? 2012: Emma Martin of Dege & Skinner wins BBC3’s jazz themed Young Tailor of the Year award, with her Oxford Bags wowing the judges. Savile Row is the scene of a very well dressed protest as scores of readers of The Chap magazine assemble outside No. 3 to protest against Abercrombie & Fitch’s plans to take over the building. June, and the tailors of the Row play their part in the British Fashion Council’s inaugural London Collections: Men by hosting Savile Row Open Day (see the News section) and a stunning cocktail party in Burlington Arcade. 2013: Savile Row’s stunning contribution to the second London Collections: Men is The English Gentleman at Spencer House. Sixty models are dressed by the Row’s tailors and effortlessly demonstrate that Savile Row remains the centre of classic men’s style. March, and the Savile Row Room opens at The Campaign For Wool’s Wool House exhibition at Somerset House with queues quickly forming for the cutting and tailoring masterclass demonstrations. An exciting new chapter begins for Huntsman as internationally acclaimed couturier Roubi L’Roubi takes the reins of this most venerable of Savile Row houses as owner and Creative Director. 2014: The Row makes its own inimitable contribution to London Collections: Men men’s fashion week with its brilliantly original The English Gentleman presentation at The Cabinet War Rooms in January and the fascinating Meet Me in Rio film in July. May sees Open Row, as our members work together with our partners Chivas to open their doors and give 300 style-conscious individuals a never before behind-the-scenes look at the workings of our famous street. 2015: The year gets off to a flying start with Savile Row’s The English Gentleman taking up the prestigious closing spot of January’s London Collections: Men with another eye-catching presentation of the art of bespoke tailoring and contemporary men’s style, this time at Apsley House, the palatial London home of the Duke of Wellington. To coincide with LC:M, the revered Huntsman opens an in-house pop-up store at 11 Savile Row to showcase the collection of clothing inspired by the role of a fictional spy HQ that it plays in the major new feature film Kingsman: The Secret Service. 2016: Chairman of Henry Poole & Co and Godfather of Savile Row Angus Cundey is awarded an MBE for services to bespoke tailoring in the New Year’s Honours. William Skinner, the Managing Director of 151-year-old Row stalwart Dege & Skinner and the fifth generation of his family to join the tailoring trade, becomes the extremely well qualified Chairman of the Savile Row Bespoke Association. 2017: The Savile Row Bespoke Association offers an up-close, fine-focused look at life and the incredible working practices on its famous street with the launch of its Vimeo channel. The rich, progressive history of Savile Row is again underlined as modernizing Richard James celebrates its 25th anniversary and Welsh & Jefferies, which has a proud association with Eton College, its 100th. 2018: Savile Row itself is smartened up and made more visitor-friendly as Savile Row Strategic Group initiated works see the footways widened, the carriageway reconfigured and silver granite parking pads installed on the west side of the street. More recognition from upon high for the Row as Richard James, he of the eponymous Savile Row house, is awarded an OBE in the New Years Honours list. Richard Anderson looks to the future in his latest tome Making The Cut, and explains how Savile Row is embracing technology and colour to reach a new, ever-growing international demand for the finest bespoke tailoring.